L.E. Phillips Memorial Public Library on November 30. Brenda Brousseau was about 10 years old when her grandmother took her to an exhibit of Native American beadwork at the Grout Museum of History and Science in Waterloo, Iowa, her hometown. The exhibit featured all sorts of beadwork: cradle boards, rattles, pouches, headdresses, and clothing. Afterwards, her grandmother bought her a bead loom at the gift shop. And Brenda, totally self-taught, has been beading ever since. She now beads by hand – without a loom – in the Twin Cities. Her exhibit “Head vs. Heart,” which features her beaded headdresses and mandalas, will be on display at the L. E. Phillips Memorial Public Library in Eau Claire from Nov. 30 through Jan. 6. 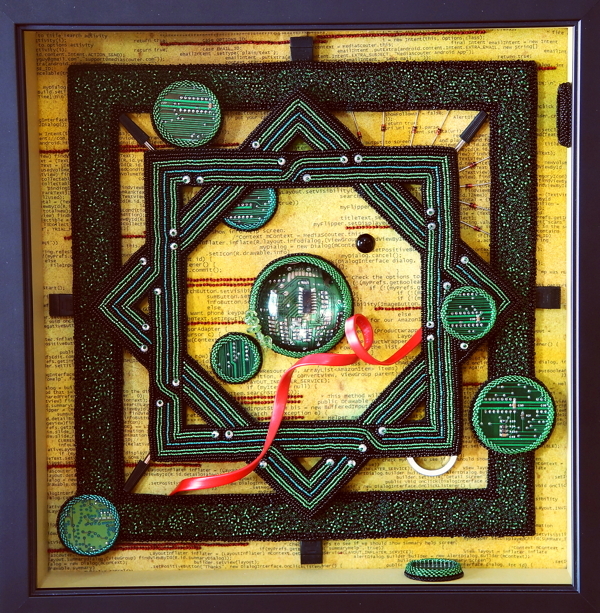 A reception will officially open the exhibit in the gallery on the library’s second floor at 7pm Thursday, Dec. 4. 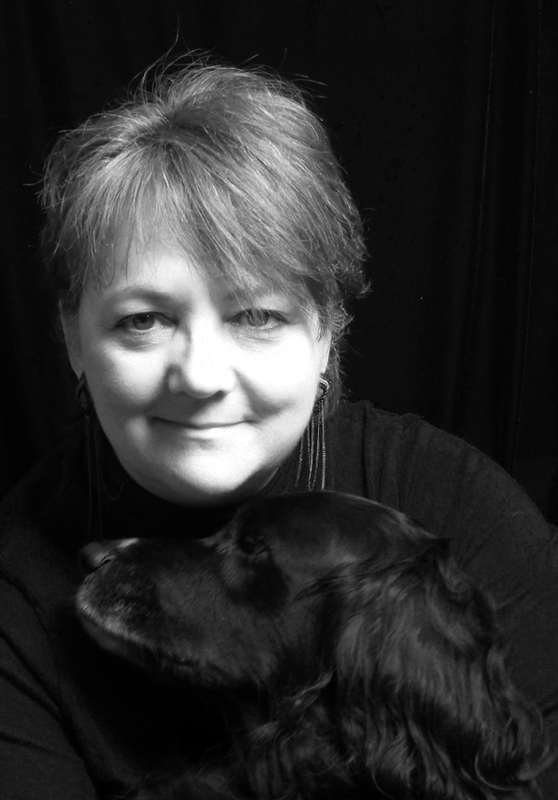 A coinciding event will be held at the Eau Claire Regional Arts Center’s Janet Carson Gallery at 5pm. She then went straight from headdresses to mandalas, craving a form that could still be layered with meaning and symbolism, but one that people were more comfortable buying and knowing what to do with. After all, you can hang a mandala on the wall. Simply what’s happening in her life can inspire her as shown in the exotic Queen and Medusa-like crown headdress: “It’s Not Nice to Fool Your Motherboard.” Brousseau shared that she was in the throes of fixing the motherboard on her computer when she received the call to entry for a show. Artists were asked to create a piece that symbolized what the Internet meant to them. 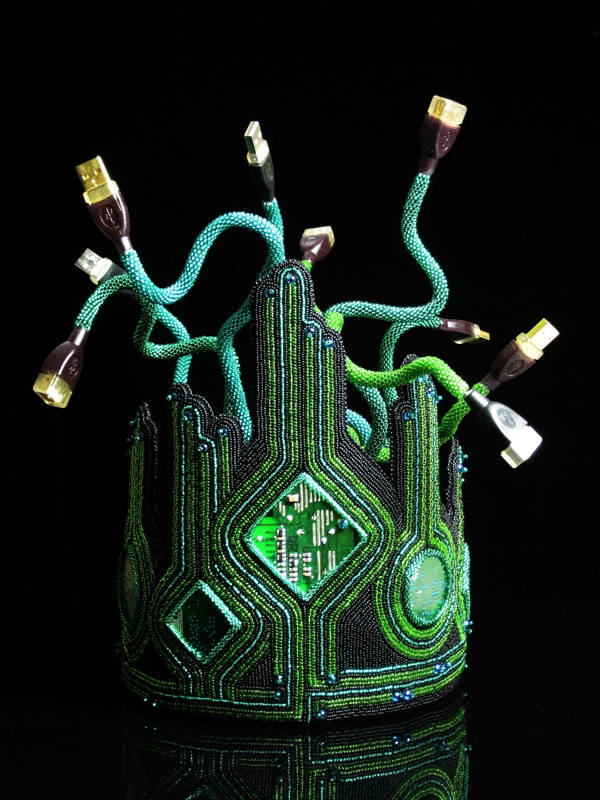 Brousseau incorporated USB ports and circuit board into the headdress for an elegant, whimsical, wearable piece of art. Yet, Brousseau doesn’t bead full-time. She owns a software company that is developing an app that can be used on smartphones that galleries can use to tell the story behind the art. Yet she maintains and works in a small 10-by-16-foot workspace. North High School art teacher Janice Roberts was at the Phipps with Shafer then. “I was struck by the amazing intricacy of Brousseau’s sculptural beaded headdresses and their power to evoke a spiritual or ethereal feeling,” she said. And what of Brousseau’s grandmother who sparked her interest in beading? “She passed away about 10 years ago at age 98,” said Brousseau. “And she had Alzheimer’s for the last 10 years of her life, so she did not know the extent of my artwork.